Hey loves! My latest style column for Lauren Conrad is up. Be sure to swing by LaurenConrad.com to get all my tips on one of fall's hottest trends here. i LOVE these looks! that skirt is so fantastic!!! You look gorgeous, Anna! Both of these looks are so chic. I read this on LC's website, and it was great! 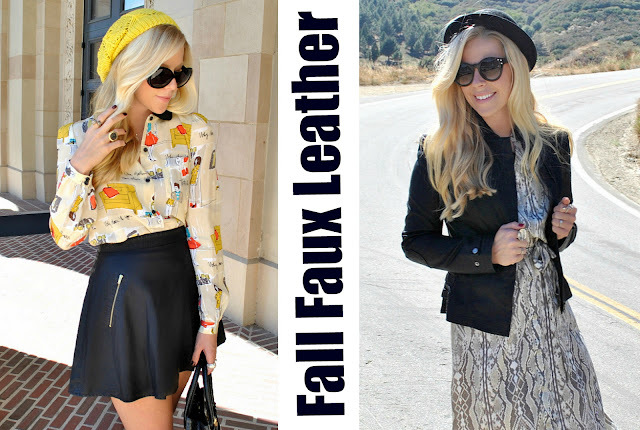 I love faux leather for fall as well. in love with your blouse Anna! I love the leather skirt outfit, you look so pretty and so chic! Such great looks! My favorite is the left one. How cute are you in that knit hat??? I love it and you pull it off perfectly. Me? Not so much! Headed over to LC.com to check out your latest post! You are such an inspiration Anna. So proud. So happy for you Anna! Love reading all of your articles and posts about fashion and finds! I love your shirt and skirt! Gorgeous as usual! Love that skirt! saw this on yesterday's post, and loveeee the leather pieces you got goin on, especially the leather jacket paired with the hat!! Really obsessing over leather skirts right now! In love with those flowy leather skirts! I want one so bad!! Looking lovely as always! I have always loved you and the LC collaboration! You look gorgeous! Can't wait to check it out! Really love it and you look amazing! Beautiful pictures, Anna. You are my a favorite fashion blogger out there. I love that skirt on the left. And I will definitely be checking out your column on Lauren Conrad's site! Love Love Love this post! Im obsessed with faux leather. Keep on the good work love. I love this post and love your outfits. You looking so beautiful. Looking great Anna! You rock that hat! Love the skirt! It's stunning! Obsessed with that kate spade blouse !!!! Love both outfits ! you're living the dream ana! so excited for you =) great column! Love both of these outfits. your skirt is beyond gorgeous! Im looking for the perfect skater skirt myself. that skirt is soo gorgeous!!! I love that Kate Spade blouse! Gorgeous! I always love seeing your post in LC's site. I even voted for you. Keep posting about trends, those are my favorites. I've been obsessed with that free people skirt for a while now! obsessed with that kate spade blouse! The love the button down!!! This was such a cute post for LaurenConrad.com! The faux-leather trend is so great when done the right way, and I love the ways you styled it! Your island dose not have to be made out of the material or color as the rest of your kitchen.